The Young Parents Program in Crete, NE is funded by the Sixpence Early Learning Fund. The program takes young people – mostly from Crete High School – who become parents at an early age and need education and support to build a healthy, productive life. The program consists of parenting classes and home visitations, where Stephanni Renn can work one-on-one with young parents to improve interactions with their children. This is the story of one of the families Stephanni has helped over the last few years. Sonia moved from Minnesota with her boyfriend and his mother when she was a junior in high school. At that time, her son Ernesto was 6 months old. Sonia’s parents were very low-income, so were never able to help with support or even come visit Sonia and their grandchild. Crete High School referred her Sonia to the Young Parents Program which is when she met Stephanni, her home visitation professional – and soon-to-be biggest cheerleader. The 16-year-old didn’t know what to do with her baby. Sonia and Ernesto lived in a trailer with Sonia’s boyfriend and his mom, but they had no other family or friends. “We were her support system,” shared Stephanni. The Young Parent Program made sure Sonia got to doctor appointments for herself and Ernesto, educated Sonia about how Ernesto should be developing at different stages, and taught her parenting skills in her home. Stephanni would video tape interactions between Sonia and Ernesto and then show them to Stephanni, asking where she saw positive interactions and what could be improved. With parenting help and a support system behind her, Sonia began to do very well in school. She graduated as a national honors society member, won the Susan Buffet Award, and received several grants for college. After graduation, she enrolled in the University of Nebraska – Lincoln to study nursing. In 2011, Ernesto was severely burnt at a family barbecue. Sonia had gone in the house and left her son in the care of adult relatives. The boy tipped a kettle of boiling water onto himself, burning 90% of his body. 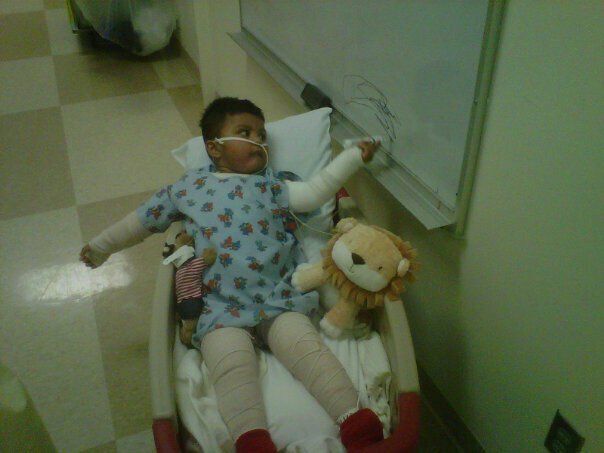 Ernesto spent 6 weeks in the burn unit at St. Elizabeth’s. “She never left his side. Not once,” Stephanni says of Sonia. The Young Parent Program sent someone up to the Lincoln hospital three times a week to support Sonia and Ernesto and to bring them meals. Naturally, Sonia had to back off of her school work while Ernesto was hospitalized, but she still maintained her GPA. “If she got a B, she would sign up to retake the class,” Stephanni says. Now, she’s finished with her UNL coursework, and is heading to UNMC this fall to complete her nursing degree. Even with all of this, Sonia comes back and does volunteer work in the Young Parent Program. As for Ernesto, he is in preschool now and is developmentally exceeding all of his milestones. Mother and child are tightly bonded and Sonia has become a capable and loving mother. Sonia kept succeeding despite the absence of parents, being a teen mom, Ernesto’s injury, and going to school. The heavy involvement of the Young Parent Program played a critical role in getting her the support Sonia needed to succeed at motherhood and life. “Everybody needs a cheerleader,” said Stephanni. So wonderful. Way to go Sonia.